I first saw the brilliant Hellboy film, starring Ron Perlman (who was born to play this role), which tidily summarises big chunks of the Hellboy story. 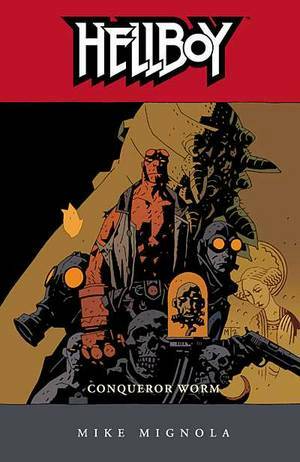 Finally, last year, I started reading the original Mike Mignola creations, and they’re just beautiful. Hellboy 1, Seed of Destruction – The origin of Hellboy, who emerges from Hell in some part of England at the bidding of of Rasputin, who is sending orders from Norway because he wants the right hand of doom to unleash total destruction… or something. Strange tales of the Arctic, ancient Arctic temples, secret Nazis, freaky frogs biting Trevor Bruttenholm to death, sleazy frog monsters, a disconsolate mother and all sorts of other freaky insanity. The pages are nearly all mystery and shadow, with lumpy lines showing where people/things/animals are supposed to be. Hellboy fights the frog creatures, everybody goes splatting everywhere. Hellboy gets beaten to a pulp, Rasputin raises Lovecraftean ectoplasm Elder Gods, Hellboy defeats the menace… and Rasputin. Plenty of scenes of the seven sinister wedges wobbling in space, the entrance of the Kirbian anti-eldrich aliens (just two pages of them – they’ll return later). The appendix has some pages of sketches (just as most of the books in this collected works series do), and two early adventures: Hellboy confronts Anubis in a mid-Arizona desert diner, and then he confronts Von Klempt and Kriegaffe Number Nine. Nice. The latter is fitting (as its occurrence is mentioned happily later on when Hellboy next meets Von Klempt again), but the former is a bit weird – it’s one of those episodes where Hellboy seems like a bit of a bumbler, easily captured or incapacitated by a monstrous adversary, only to win the battle in spite of himself (in this case, Anubis accidentally walks into a sharp object – d’oh! Note the heavy use of Japanese Fudo Myo-o imagery, despite Mignola saying that he’d never been to Japan before drawing some of these adventures (maybe he’s been there more recently). His source for ideas must have access to some rather eldritch stuff. Hellboy 4, “the Right Hand of Doom” – Largely a collection of unconnected stories, it starts off with the classic “Pancakes”, a tale of the young Hellboy that registers the exact moment when the hordes of Hell realised that their emissary (Hellboy, in possession of the right hand of Doom no less) had been lost to them. “No way, I don’t like pamcakes! …Hey! I love it! !” Then there’s Hellboy’s meeting with the Osiris Club, who send him to slay a dragon in the forest – which he defeats in a lucky, bumbling way (see also his meeting with Anubis in Issue 1). In King Vold, he meets an opportunistic folklorist, who has a fey (and treacherous) way of dealing with a cursed hunter in the sky and his were-demon… much to Hellboy’s (and eventually his) regret. “Heads” is a great adventure in Japan, when Hellboy meets a group of ghouls. One of them tells a peculiar “funny story”… but Hellboy knows what they are and he is ready for their trap. There’s a misadventure with a piece of Lovecraftean ectoplasm who channels a psychic, and then a meeting with a vampire who makes Hellboy dream of the ultimate Varcolac (I first learned about this Romanian creature in the 1963 Mario Bava film Black Sabbath, starring Boris Karaloff – yes, it’s the film that gave the band the name, except it was spelled as Wurdalak). 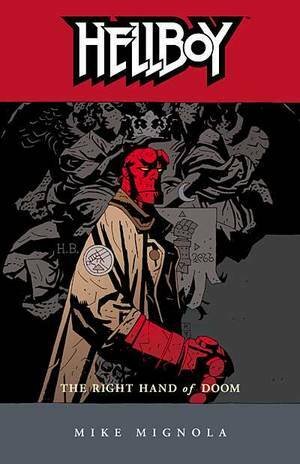 The Right Hand of Doom is a short-ish story where nothing much happens, but a priest tells Hellboy the story about his red right hand. “Box Full Of Evil” is a fascinating study in minor demons and earthly damnation, as well as a bit of a mystery – who is this strange fat man who uses the hand of a hanged man as a candle to help him incapacitate people – black magic! Demons resurrect (minor demons), Hellboy is nearly beaten to death, he discovers his true nature and triumphs; Abe Sapien battles a monkey, and Hellboy re-encounters the leprechauns; finally a bit of Astaroth action as a major demon makes an appearance to… have a talk. Wow. Great guest sketches at the end, including ones by Michael Allred, and also Frank Miller. Hellboy 5, “Conqueror Worm” – One long story throughout. Hellboy and Roger the homunculus investigate strange Nazi goings-ons in Austria, only to find out that there’s a new Nazi conspiracy trying to re-connect with a horror set in motion in 1939 that aims to give Lovecraftian ectoplasmic elder gods earthly form so that they can bring about the end of the world (sure, why not?). There’s a Rubezahl and the second appearance in the Mike Mignola universe (first appearance in the pages of Hellboy) of the totally bitchin’ Lobster Johnston – an early Captain America, to be sure – and some really spooky 61-year-dead talking skeletons. Another Kriegsaffe, number 10, captive executioner aliens executed, haunted scientist Herman Von Klempt’s head floating in a jar with robot arms and electric zappers, an army of human experiments emerging from the jar after 61 years, talking bats and rats and snakes, new frog creatures, and another encounter with a shadowy Rasputin-like figure (actually, it is Rasputin), before the final confrontation with the evil ectoplasm. Great meeting between Rasputin, Hecate and Baba Yaga. Hellboy 6, “Strange Places” – Hellboy goes to Africa to meet a strange wandering sorcerer who sends him to battle sea hag Bog Roosh and her three misguided grand-daughter mermaids. They capture Hellboy and two are foolishly destroyed by their monster of a grandmother, who needs to wipe Hellboy off the earth to prevent the apocalypse, blah blah blah (everybody is so worried about the right hand of doom). Wonderful horror, flooded tombs, fate and destiny, the evil bones of a drowned werewolf bent on revenge against Hellboy, whales, bells, the eye of Baba Yaga, eldritch forest spirits doomed by Hellboy’s capture, besotted hog-man Gruagach (who only dreams of revenge against Hellboy) at council, not to mention the souls of dead sailors in their jars. Caribbean pirate ghosts and Hecate reveling and debating with Hellboy, a dead heretic revived recounting the ancient creation of the race of humans, demons and elder gods, including the formation of the right hand of doom itself, preserved for a time by the Hyperboreans (crazy, all-over-the-place story, this), and the spectre’s ultimate reduction from a demon to a ghoul re-executed by a long-dead Inquisitor (shades of witch hunter Henry Hood here). Wow! 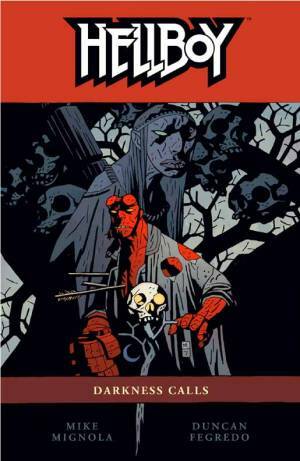 Mignola includes illustrations from a pirate ship graveyard story that he was never able to finish, showing Hellboy battling the moss monsters. Righteous! No word balloons, but lots of reading between the inked and early pencil sketch lines (possibly one of the coolest things I’ve seen in the Hellboy books so far). Hellboy 7, “The Troll Witch and Others” – A collection of short stories, some of them not drawn by Mike Mignola, showing Hellboy on his various adventures. The Penanggalan shows him traveling to Malaysia to defeat a girl-witch, and The Hyrda and the Lion is about Hellboy’s battle in Alaska against a hyrdra, and his meeting with a little girl-lion (from the notes we read that this story was inspired by his daughter’s claim that she’s half lion). Beautiful mystery, marvelous quirkiness. The Troll-Witch is about a pair of young sisters, one beautiful and one ugly, and the strange fate that befell them – one has her head snatched during a troll invasion, the other uses Hellboy to extract her revenge – trapping them out-of-doors after dawn so that they turn to stone. The Vampire of Prague is illustrated by P Craig Russell, who I think I’ve seen in Heavy Metal magazine. The tale ends in a similar way to Troll Witch, but not after plenty of myth-building about this crazy gambler vampire, and one epic battle above the rooftops of gothic Prague. Dr Tarp’s Experiment is a BPRD tale that takes place in a split second in a hidden experimental chamber of a long-dead member of the Golden Lodge of the Heliopic Brotherhood of Ra, involving a blood extraction from Hellboy and the momentary creation of yet another homocidal ape monsters. The Ghoul is a tale of those that live among us. The long end-piece, Makoma, is a convoluted tale of the African king Makoma, who we first see as a modern-day mummy in an archaelogist’s study but who was once Hellboy born in an long-lost early civilisation who battles and defeats the wilderness demons of the mountain, river, forest, water, fire and puts them in a bag, then makes deals with forest magi. Mike Mignola starts it off, but Richard Corben, the illustrator of Den and other tales, takes it over, giving it also a rather Heavy Metal feel to it. Great pencil illustrations from Mike Mignola at the back. Hellboy 8, “Darkness Calls” – The return of creepy wizard and half-man Igor Weldon Bromhead, Ilsa Haupstein/Hecate and the withered corpse of her lover, Vladimir Giurescu, Hellboy in slippers with whiskey shots in Harry Middleton’s haunted house in the UK, victim of a coven of witches, captured by twisted forest spirits, fighting them alongside the reanimated corpse of corrupt witchfinder Henry Hood, wild councils of witches and a declaration of war with the savior of the dark arts. 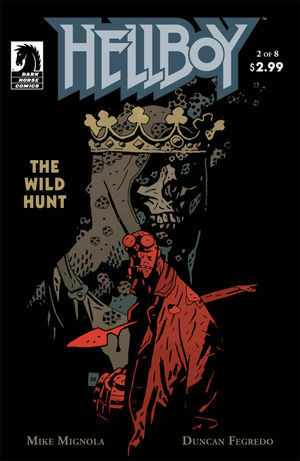 Suddenly, unexpectedly, Hellboy is fighting armies of the undead in the forests of Russia, armies resurrected by Baba Yaga, who is ready to devote all of her power to defeat Hellboy. Leshii, the pagan god of Russian forests, sends his wolves to rescue Hellboy (?!?! ), a temporary alliance only. Baba Yaga enlists mass murderer Koshchei the Deathless (whose soul Baba Yaga has hidden inside an egg inside a duck inside a rabbit inside a goat) against Hellboy. Perun the god of the world is killed (why not, right? ), Hellboy battles Koshchei, the deathless fighting the deathless, both of whom can only be slowed down but never stopped, ha ha ha. Hellboy gets aid from a cute littly girl spirit Vasilisa the Beautiful, who yields a skull staff, Koshchei pinned to the floor like a bug. Humour, madness, death, dolls, the undead cardinals of the forest, Baba Yaga plotting with the gnomes with her tree of skulls, the roots of the earth rising to aid Hellboy, who returns near-destroyed to Henry Hood and the graveyards of Britain to destroy the grotesquely mis-shapen Igor Bromhead, who begs him to put him out of his misery and send him to Hell. There’s the death of elfking Dagda and two epilogues, one drawn by another artist who recounts a day of drudgery at the BPRD that reveals the mystery of Harry Middleton, and another by Mike Mignola that is Hecate’s monologue on the history of magic, through the Hyperborean age of witchcraft, into the modern day and Hellboy’s mission. At the end there are great pencil sketches. All of these artists were so in love with drawing crumbling, wasted buildings. The ruins of humanity we see all around us, Entropy the Victor. By this book, Nazis hardly make an appearance – seems Mignola has either had Hellboy defeat the only ones left, or he’s bored of them – most likely the latter, the world of fantasy and sorcery will never run out of Nazis. Hellboy, Masks and Monsters – A somewhat retarded and fairly unnecessary Hellboy/Batman/Starman (who?) adventure. Ted Knight, the original Starman, is captured by Nazis and our three heroes try but fail to prevent him being spirited off to San Diablo (great name) in South America (where else would Nazis hide out?) to resurrect a Lovecraftian Elder God. Batman stays behind, but Hellboy and Starman figure out how to stop the Nazis in their mission by blowing everything up. Nice. The second half of the book is about the ghosts of Arcadia, a wretched hive of scum and villainy that looks like New Jersey, with the restless murdered souls becoming masked spirits and laughing monkeys that try to trick Ghost, the female spirit of vengeance, into bringing Hellboy to them for their own uses. Hellboy, the world’s greatest paranormal investigator (as described on the cover of Time), figures out who these minor demons originally were and dispatches them. Not a great story, but okay – Ghost is hot. At the end there are the original Mike Mignola layouts of the Ghost story that he did with penciller Scott Benefiel and inker Jasen Rodriguez. There’s also a model sheet for Hellboy with notes, explaining that his tail is rounded, not pointed, that the palm of his hands are never shown, and describing his pants, overcoat, holster and hooves. Righteous, an worth the price of admission right there. 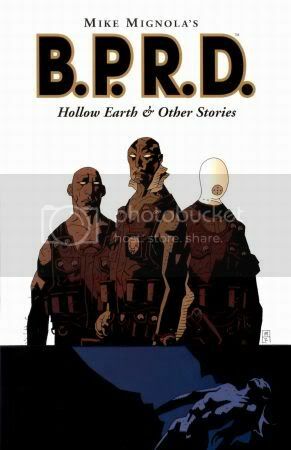 BPRD 1, Hollow Earth and Other Stories – I read BPRD because it was created by Mike Mignola, always hoping that it will be more interesting than Ghostbusters or X-Files. BPRD 1 introduces a new member of the bureau, Johan Kraus, a medium who was out-of-body during a seance when everyone at the seance was toasted – with no body to return to, his ectoplasm was housed in a BPRD-made suit, he wanders the earth with our disillusioned team Abe Sapien (will he leave BPRD or won’t he), the more human than human homunulcus Roger, Liz Sheridan the firestarter (she’s hot), and administrator Kate Corrigan. But what exactly is the nature of Kraus’ fascination with the absent Hellboy? Yawn. The Hollow Earth starts with Liz’s near-death in a Tibetan monestary, where all the monks have been slaughtered. That’s because there’s a shaft from there to the hollow earth and the mole men who live there (not to mention the graves of Nazi digging machines and other rotting primordial construction equipment) planning their revenge against the creatures of the surface. Silly. The early pages are rather Mike Mignola, while the rotting cyclopean underworlds are pure Jack Kirby. The Killer In My Skull is the first appearance of Lobster Johnson from a 1999 issue, and a nice bit of investigative journalism – members of an elite team of scientists are getting killed one by one by a member of the team… but which one? It can only be the one who survives, who happens to also have scary hair (and, eventually, an animated killer brain), of course. Amazing how Mignola can take the most cliched ideas (mad scientists, killer brains, reanimated Nazis, intelligent homicidal gorillas) and make them sinister as hell. Abe Sapien Versus Science is a short piece about the inhumanity of scientists against the soul of a gillman. Drums of the Dead is about the sunken ghosts of the Africa-Americas slave trade, and Abe Sapien freeing the lost souls (there are sharks too, as well as the war pig of MotÃ¶rhead fame, cool). Nice pencil (and some water colour) sketches at the back. 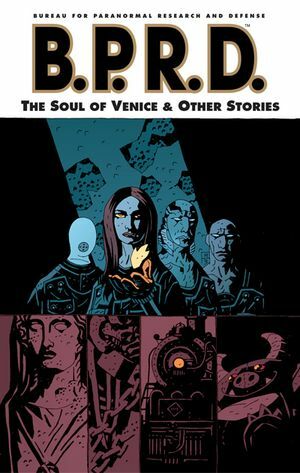 BPRD 2, The Soul of Venice and Other Stories – The Soul of Venice is about Cloacina, the spirit of Venice, as well as Venetian wizards and vampires – Romulus Diovanni who slew a vampire and drank his blood, becoming a blood-thirsty non-vampire scourge of the islands, a worshipper of Shax (a relative of Hellboy) who rejects his offering, destroying the fiend. Dark Waters is about the souls of those drowned as witches in old New England and modern-day zealots condemned. Pretty pictures, but none of these stories lead anywhere. Night Train is another tale of Lobster Johnson, Nazi spies in 1930s America, the dead of a train wreck coming back in modern day for revenge that the BPRD needs to deal with. There’s Something Under My Bed is like a weird re-do of Monsters Inc, while Another Day In The Office is a silly zombie tale. Sketches at the back. This entry was posted on Thursday, October 20th, 2011 at 10:11 am	and is filed under Uncategorized. You can follow any responses to this entry through the RSS 2.0 feed. Both comments and pings are currently closed.